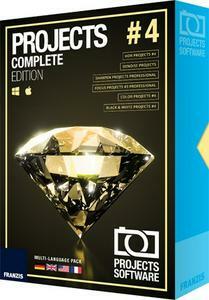 PROJECTS 4 Complete Edition - Your ultimate photo-editing Suite. Amazing tools for your perfect workflow! Our tools work as plug-in to Adobe Photoshop and Lightroom and as a standalone application. This is magic. Start with complete light information. Once you have seen HDR images, normal images will just seem boring. HDR projects 4 enables you to generate very precise lighting situations that are not possible with "normal" photography or photo editing. The newest process for super realistic images with unbeatable contrast and detail that you have never seen before! Your advantage: No more guesswork - you'll see how changes effect your photo immediately! Your Advantage: All photo editing steps in one program DENOISE projects professional DENOISE projects professional expands your scope as a photographer, enabling you to create fascinating twilight, wildlife, event, underwater and astro images as well as available light shots. DENOISE projects is currently the only available software that removes all seven forms of image noise: luminance noise, colour noise, banding, colour clouds, hot pixels, salt & pepper as well as holes. The completely newly developed Smart Pattern Matching noise technology perfectly removes noise from your images while still keeping the colours, sharpness and finest details. Applicable for up to 12,800 ISO and higher! Complete RAW converter including distortion correction COLOR projects 4 Dull colours, matt shadows, cloudy sky, afternoon sun - the perfect light is hard to come by. Forget everything you have heard about photo editing to date, COLOR projects 4 is your magic wand for your photos. Enjoy photography and create fabulous pictures. fore! Intelligent optimisation from "Natural" to "Highkey"
127 Expert filters BLACK & WHITE projects 4 BLACK & WHITE projects 4 is the perfect tool to enable all photographers with a special affinity for black & white photos to make their creative mark. The brand new spectral sensitivity engine allows you to grasp the grey value for every converted colour and customise it to any tone value. The 115 handcrafted presets offer you a plethora of options from your images' hidden information. Give your picture a 100% analogue finish with high-res film emulations adapted from classics like Ilford, Kodak, Rollei and Fuji. Brighten and enhance details FOCUS projects 3 professional With FOCUS projects 3 professional, you can use an exposure series to create an image with fantastic depth and where even the smallest object is in crisp focus from front-to-back. The smaller the object being photographed and the lesser the distance, the narrower the area of focus is. Particularly with full-frame cameras, this field of focus can amount to less than a millimetre. The solution: FOCUS projects 3 professional! New: Selective image retouching ANALOG projects 3 Get the hippest styles, like Instamatic, with ANALOG projects 3. The unique tools in ANALOG projects 3 allow you to play with light sources, hues, grain, vignetting, textures, blur and lens flare effects and create professionally styled images like a photo editing pro! ANALOG projects 3 gives you full control over every effect, which you can apply as a stylistic device to create your very own trendy look. Add-on system Sharpen projects professional #1 Does this sound familiar? You took a great portrait photo, but it's just missing the wow factor! This is because the eyes need to be clear, but the skin needs to appear soft. With SHARPEN projects professional that is no longer a problem. The sensitive-selective edge recognition allows you to make a pixel-exact selection which makes it possible to sharpen defined areas individually.